UT2600 is a "demake" of Epic Games' Unreal Tournament, specifically for the Atari 2600 / Video Computer System. UT2600 provides fast paced arcade action for a minimum of two players. Up to six players can compete in a tournament of one-on-one matches, either individually or as part of a team. You can use a free emulator program such as Stella or you can play the game directly in your web browser. 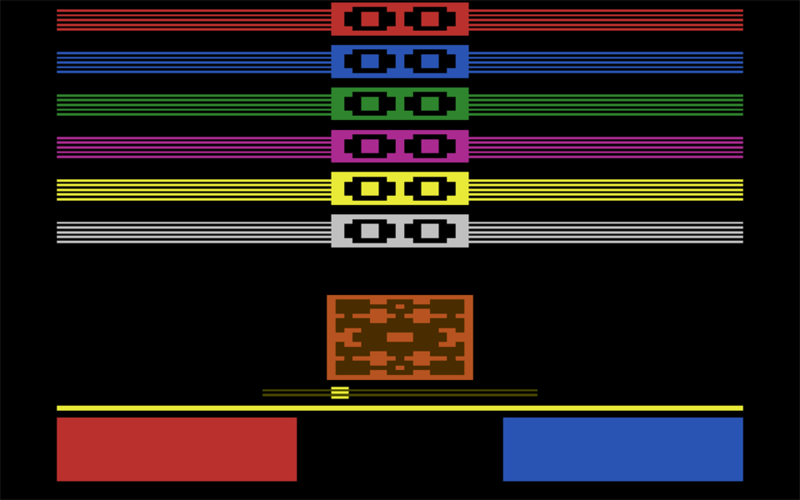 Of course, the game was made to run on a physical Atari 2600, but as a cartridge release is still on the horizon, the only current means to get the ROM onto your 2600/VCS is by use of a utility like the Harmony cartridge. UT2600 is currently in open beta and can benefit from your feedback. The main screen you're greeted with after the title. Here you can configure UT2600 to your liking (see below), after which you will proceed to the map selection for your match. Move the joystick LEFT and RIGHT to switch between all available maps. To start the match, both players need to confirm the map by pressing the FIRE button. Up to 6 players may compete. Playing in teams is available by selecting TEAMS OF 2 or TEAMS OF 3. Teams are RED, GREEN (and YELLOW) against BLUE, PURPLE (and WHITE). During Team games, players only play matches against all members of the opposite team, while during non-Team games, players play against all other players. Each match revolves around 2 players. Every other match the active players will switch, so be sure to remember your color! Choose between Capture the Flag or Death Match. During CTF matches, players try to capture their opponent's flag and return it to their own flag while the latter is in it's own location. Getting killed will drop the flag you're carrying. Unlike UT99, a dropped flag will not automatically return after 15 seconds, but must be returned by the owner of the flag by running over it. Choose between Beginner or Advanced. The ADVANCED setting enables the Translocator and jumping. But it comes at the cost of slightly more complicated controls. During matches, blinking boxes appear randomly on the maps. Running over these boxes gives you either a weapon or a power-up. When Pickup Type is set to Random, a weapon you pick up may be less powerful than the one you had! Random: A random weapon (which may be less powerful than the one you had) or a power-up. This setting determines what will happen when you run out of ammo. One Down: The opposite of the Single Up Pickup Type. You'll receive the next 'lower' weapon. Two Down: As One Down, but two steps instead of one. Enforcer: When your current weapon runs out of ammo, you're left with an Enforcer. If you run out of ammo for the Enforcer, you'll get the Impact Hammer. Hectique: Play with the No Pickups option. Random weapon and 1 ammo. Each time you fire your weapon, it runs out of ammo and you immediately receive another random weapon and 1 ammo. Determines what score a player must achieve in order to win a match. For Capture The Flag matches, a win can require either 3 or 5 flags captured. For Deathmatch either 10 or 15 frags will constitute a win. The match ends automatically after the appropriate score has been reached by one of the players after which you will return to the map select screen. Impact Hammer You will have to stand very close to your opponent when firing. Deals 99 damage. Single and Double Enforcer Hold the fire button while moving to strafe. Single does 10 damage. Double does 8, but fires at a higher rate. Bio Rifle A direct hit does 15 damage. Shoot at a wall or allow the blob to drop to the floor to place a 'mine'. The blob will explode after a few seconds, dealing 25 damage to anyone nearby. It will also explode when your opponent moves too close or when you press fire a second time. Shock Rifle A direct hit does 16 damage. The exploding projectile does no damage for now. Pulse Gun Each section of the ray does 6 damage. Try to aim the ray such that your opponent gets hit by 2 sections, dealing double damage. Although simplified, this echoes the original behavior of the Pulse Gun in UT99. Ripper Fires rapid moving discs that bounce off walls. A hit does 14 damage. Mini Gun Rapid firing. Deals just 5 damage per hit, but carries 80 rounds. Rocket Launcher A direct hit of the rocket deals 40 damage. The explosion adds up to another 30 damage points, for a maximum total of 70 damage. Sniper Rifle The true super weapon of the game. Holding the fire button shows a reticle. Move your avatar to move the reticle until it snaps to your opponent. Try to perfectly line up your avatar with your opponent's and release the fire button to make that head shot. A maximum of 150 damage, quickly dropping to zero if your shot is not perfectly aligned. Redeemer Press fire to take control of the giant rocket. A direct hit will deal 70 damage. The explosion will take care of another 80. So make sure you dive this one in a wall not near you. PowerUp: Big Keg O' Health Adds 100 health points. If any player's health is above 100 points, it will steadily drop until it reaches 100. PowerUp: Hologram For some time, a second avatar will be drawn for the player, horizontally reflected (on the other side of the - symmetrical - map). The opponent can only hit (and hurt) the real avatar, not the copy. Try to confuse your opponent by rapidly crossing the center of the map a few times once you pick up this power-up. When you fire your weapon, your true avatar/position is revealed. Powerup: Damage Amplifier For some time, your avatar glows bright purple and deals twice as much damage to your opponent. But be careful, splash damage you receive from firing your weapon at a near wall will also be doubled! Stand still, press and hold the trigger and push the joystick UP to jump. Use jumping to avoid blobs, rays, rockets and shrapnel and reach pickup boxes 'through' walls. You cannot however capture or score a flag by jumping towards it, as this could give one of the players an unfair advantage based on the map layout. One final warning: Your avatar will not squat when you are carrying the Redeemer, but fire it, even when you are standing still! This is because steering the redeemer is complicated enough without the trouble of firing it while running around. Stand still, press and hold the trigger and push the joystick DOWN to place a Translocator at your current position. This will be indicated by a blue arrow. Release the trigger to allow your avatar to move again. To teleport to the location where you placed the Translocator, simply repeat the same steps: stand still, press and hold the trigger and push DOWN. The Translocator can be used to quickly reach the other side of the map, defend your flag or get to a known special pickup box before your opponent. Teleporting on top of your opponent will kill them instantly! But the Translocator cannot be used strategically on CTF matches (e.g. to block access to your flag), because after telefragging an opponent during CTF, you will have to score a flag capture before you will get your Translocator back. Also, you cannot teleport with the flag of your opponent (the flag will be left behind) or teleport right after returning your opponent's flag to your own (your Translocator will be returned to you when you score a point). Whenever you receive a new weapon from running over a pickup box while advanced mode is enabled, your previous weapon is not lost, but is held in a secondary weapon slot. To switch between your primary and secondary weapons, stand still, press and hold the trigger and push the joystick LEFT. Once you empty your secondary weapon however, the slot will be empty and you cannot switch between weapons again until you pick up another weapon from a pickup box. The stats at the bottom of the screen normally show the players' health and ammo. When either player scores a frag or captures a flag, the scores are briefly shown instead. To display the scores at any time during the match, stand still, press and hold the trigger and push (and hold) the joystick RIGHT. The scores will be displayed until you release the joystick. Be aware that you cannot perform any of these advanced actions while carrying the Redeemer! Pressing the trigger will always fire the Redeemer, even when standing still. You can play UT2600 in your browser - without downloading anything - by starting Javatari using the button below. 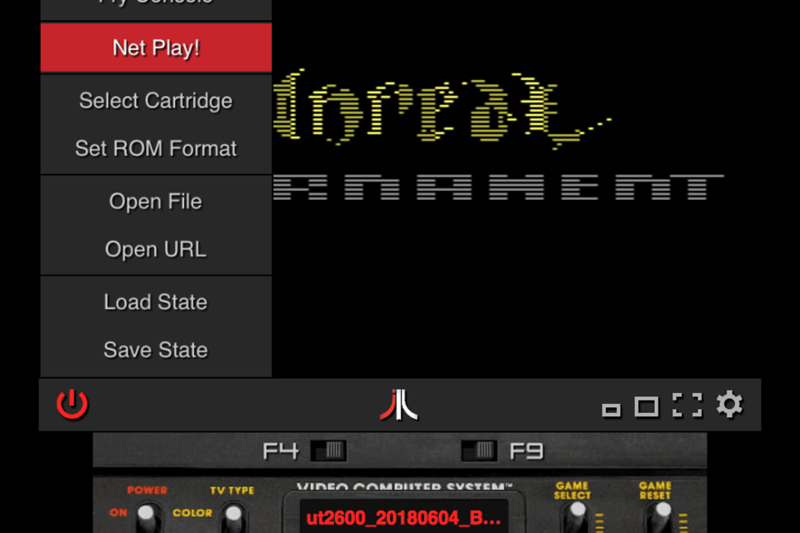 Once started, you can play UT2600 by clicking the fullscreen button on the bottom right of the Atari console that will have been injected into this page. 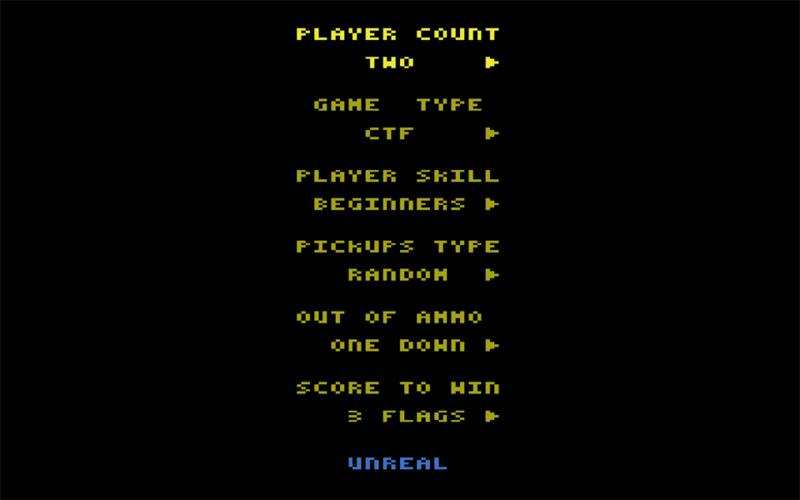 When fullscreen, click the cogwheel to access the Help & Settings to view the controls or to configure your Atari (e.g. connect joysticks / gamepads). Remember you will need a friend as UT2600 is a two player game. If you don't have a friend at hand, you can use the Net Play! mode to play against each other online. For more information on the Javatari project, view the Javatari webpage. You have been invited to a Net Play! session of UT2600. If no session is available, it is likely that your invitation has expired or that your friend chickened out (imagine that!). You can however still play and create your own UT2600 session by clicking the button below. The player who wants to host the Net Play! 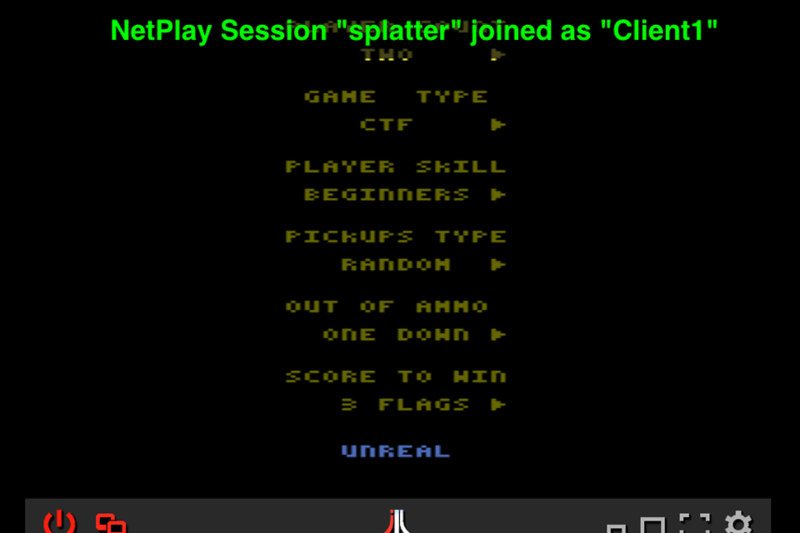 session should click the power button on the bottom left of the console and select Net Play! You can enter a name for your session and optionally enter a name to identify yourself. Now click Host. 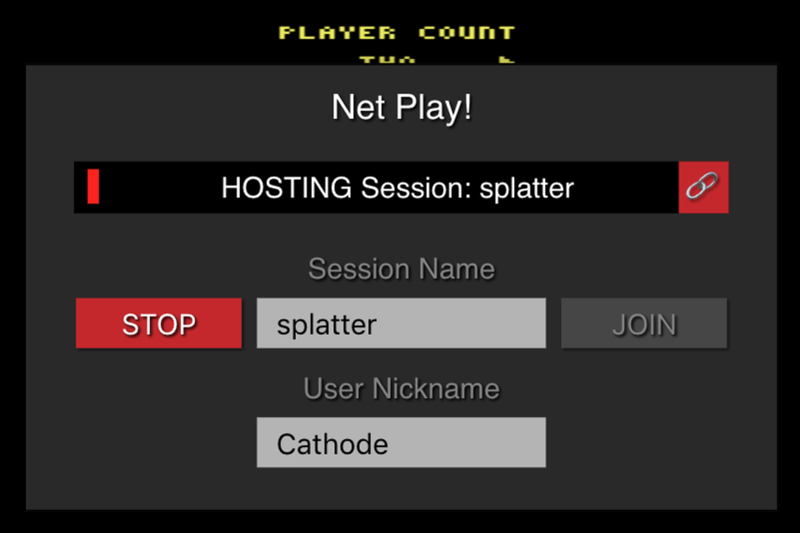 This confirms that your session is ready, click on the link button on the right of the "HOSTING Session: x"-field to obtain a unique link for your NetPlay! session. You can share this link with a friend and wait for them to join. What your friend sees when he/she follows the link. Your friend has now joined as player 2. 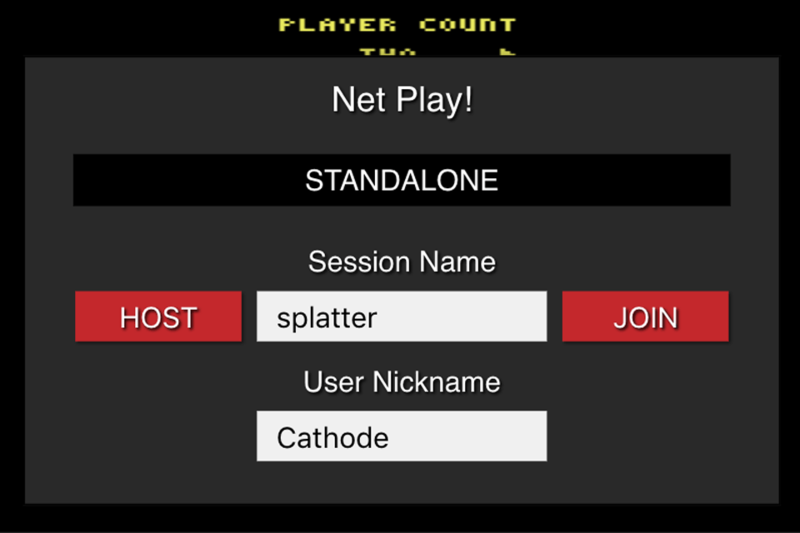 Player 1 (the host) is in control of the configuration menu and can start a match for both players to participate in. For more information on the creation of UT2600's soundtrack, you can read this article on the composers website. The first public playthrough of one of the first UT2600 betas by ZeroPage HomeBrew Video Gaming. hop on over to the AtariAge forum and participate in the dedicated forum topic.